Expect Lange and I to post random things here as the mood strikes us. My primary focus for the blog is going to be on painting. Tips, tricks, army progress. You name it. To kick it off, I want my inaugural post to let everyone know what they can expect for the next few months in regards to what I am painting and thus the techniques I am going to share. Demons. Specifically the 2000 point Demon army I am preparing for the Las Vegas Throne of Skulls GT in June. I know I ragged on the Throne of Skulls format (and I do still hate it) but the opportunity to rub shoulders with the who’s who of the North American tournament scene and shamelessly self-promote jadedgamercast was too much to pass up. Besides, Vegas baby! The tournament is 101 days away and I have all this to build and paint. That right there is the majority of the 72 model army I am fielding at 2000 points. As of this morning, I have 11 painted. That leaves me with 61 models. Not quite 1 every day but still a whole lot. I’m not going to post my list right now as I really want to focus on the painting instead. As mentioned in the higher learning for Demons (both of them) the models are really gorgeous and let you go to town as a painter. Consequently, I worked hard to build a list that had at least some representation from every God of Chaos. Some are more heavily favoured than others (here’s to you Nurgle and Khorne!) but I thought the visual look of the army would suffer without it. As the timeline is quite aggressive, I have dubbed March to be Nurgle month. If I am to succeed in my goal, I need to have all of my Nurgle models painted before the month is out. So far, it seems doable. We’ll see how it pans out. 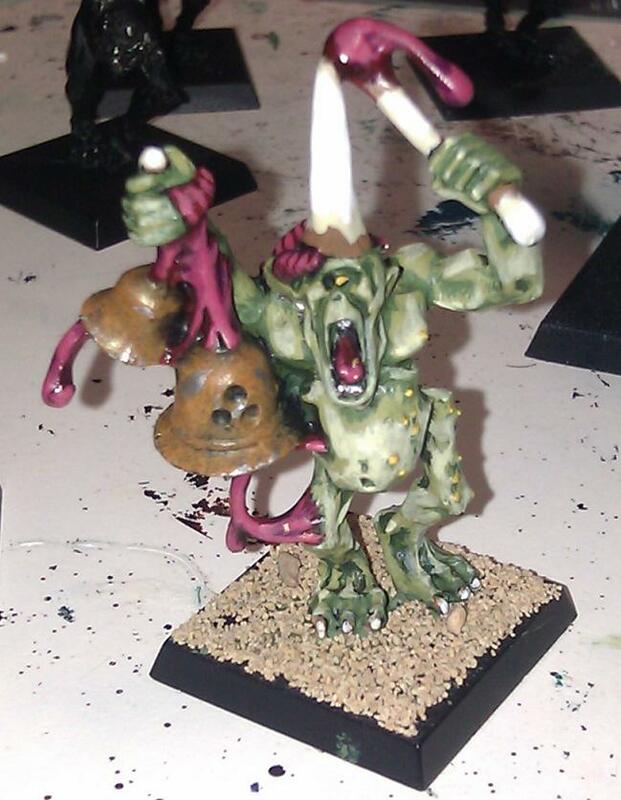 With that, I leave this inaugural post with a picture of a complete (except his base) Plaguebearer. Expect tips and step by steps to be forthcoming on the different effects I did on him. I apologize for the picture quality; they were taken with my phone. Once I remember to charge the battery on the good camera, pictures will definitely improve. Let me know what you would like me to talk about next. Step by step painting guides, the list and my reasoning or even my list building process. Leave it in the comments. Cool to see you expanding…I’d really like you guys to start up a ‘This Week in Gaming’ segment on the show. I’d like to hear what you’re playing, painting, modeling, reading or watching etc… This is usually my favourite part of any podcast. I’d also like to suggest you get on twitter! There is an awesome WHFB community on there, and it’s a great way to bring attention to the cast and your new blog!